Staffordshire Yeomanry Pudding is a classic British dessert. 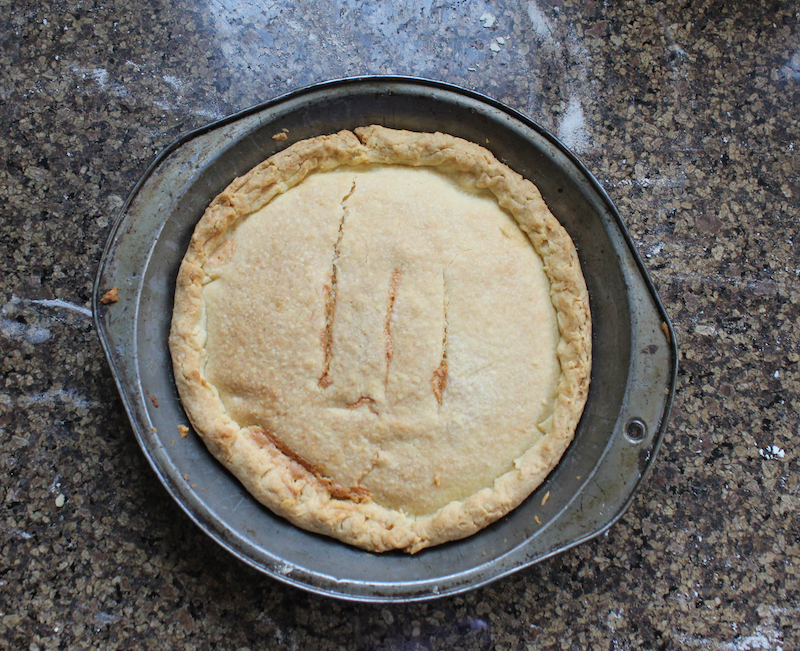 It’s essentially a pie with two flakey sweet crusts, top and bottom, baked with an almond custard filling. Join me down the rabbit hole, where one book leads to another book, leads to another book. Five years ago today, I wrote my first post on this blog, created initially to give me a place to join my two loves, cooking and writing. Over the years, as readership grew, it also became a place to connect with the world at large and make friends both in and outside the blogging community. My interest in food, culture and the history of recipes was fueled by my travels and the many countries I’ve called home. Also, I’m a sucker for any memoir that includes food or cooking as a focus. Last year I came across the memoir, Brian Turner – A Yorkshire Lad, my life with recipes at a used book sale. I had never heard of Turner, apparently a world famous chef with his own restaurant and a successful career on television, but that didn’t stop me from buying the book. His early years were the best part of the story. I love reading about how others grew up and the poor Yorkshire lad who went off to London with just £20 in his pocket did not disappoint. In the reading of that book, I came across another that seemed worth owning. Farmhouse Kitchen is based on the independent television series of the same name, presented by Dorothy Sleightholme on Yorkshire Television, starting in the early '70s. I found Farmhouse Kitchen online in a used book store and had it mailed to an address in the United States, knowing I wouldn’t get it till I went home in May. Now I’m back in Dubai again and am finally having a chance to read it. It’s short on descriptions but long on recipes, one after another after another, for classic – read: old-fashioned, down home – British fare. 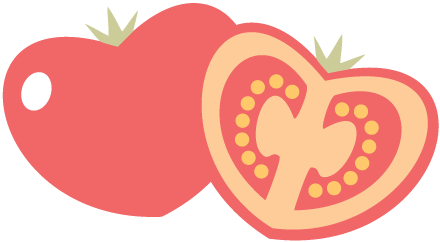 Many use ingredients that were possibly common at the time but harder to come by now, like wood pigeon and lambs’ hearts. On the other hand, a lot of the recipes can be made with store cupboard ingredients. The Staffordshire Yeomanry Pudding is one example. I always keep ground almonds in my freezer because they are an excellent addition to many baked cakes or cookies. (Why the freezer? The cold keeps nuts from turning rancid in a warm kitchen.) 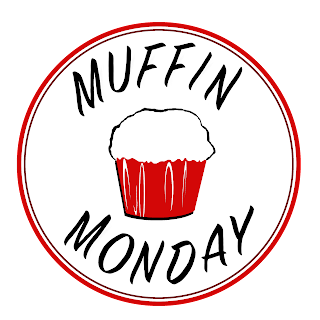 The other ingredients, flour, eggs, butter, sugar, jam, everyone will have. But where did the recipe originate and why the unusual name? Mrs. Sleightholme offers no information whatsoever, nor does the contributor of the recipe, one Miss P. M. Cherry of Penkridge. As an initially all-volunteer unit in the queen’s own army, Staffordshire Yeomanry has a long and illustrious history of defending the crown’s interests, dating back from 1794. 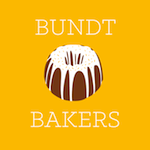 The Wikipedia page is full of information about its roles over the years but not once does it mention the pudding that bears the same name. Clearly more research was necessary which led me to this post on Book Cottages where I learned that the Staffordshire Yeomanry Pudding recipe was possibly first developed "during the height of the Boer War, when wives would bake for their returning husbands a luxurious welcome home spread, comprising of the best cakes and sweetmeats they could possibly afford." But still no mention of why the pudding was named such. Curiouser and curiouser. I had to keep digging. I must confess that I’m still none the wiser, but deep into the rabbit hole of recipe research and book buying, I’ve just ordered Good Things in England: A Practical Cookery Book for Everyday Use first published in 1932, with 853 recipes, some dating back to the 14th century. Once it arrives, I’ll be sure to report back if any light is shed on the origins of Staffordshire Yeomanry Pudding. If you happen to know more about it, please leave me a comment. 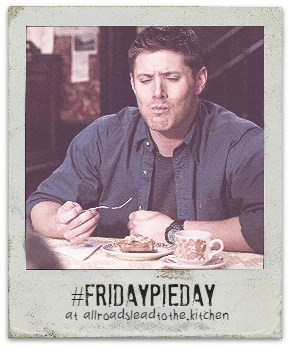 Meanwhile, if you’ve followed me down the rabbit hole thus far, you deserve some sweet pie! 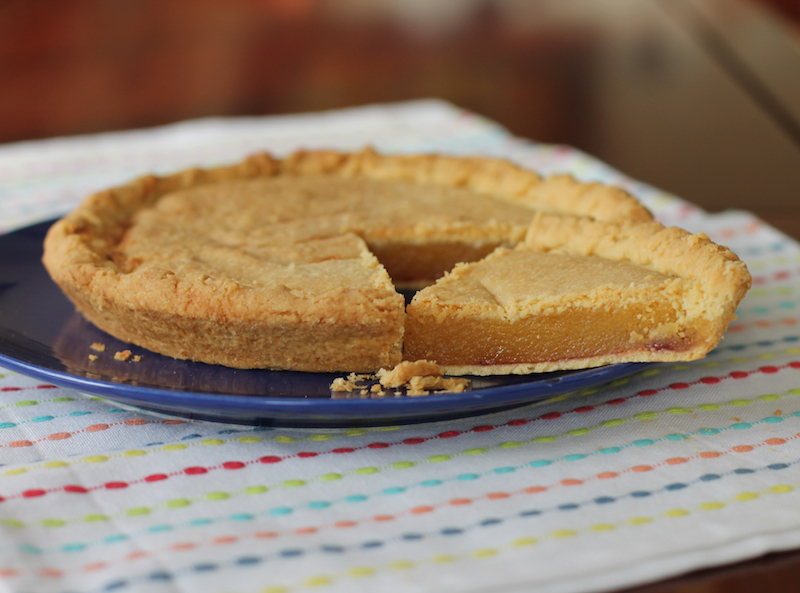 If you've been reading my blog since the beginning five years ago, I owe you much more, but pie and a great big Thank You will have to do. Add the flour and the cold butter, cut into pieces, into your food processor. 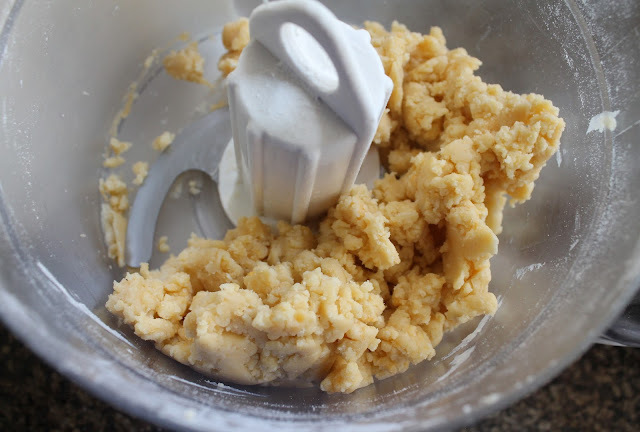 Pulse several times, until the flour and butter are combined and look like big crumbs. Add in the sugar and salt and pulse again. Add in the egg yolk and water. 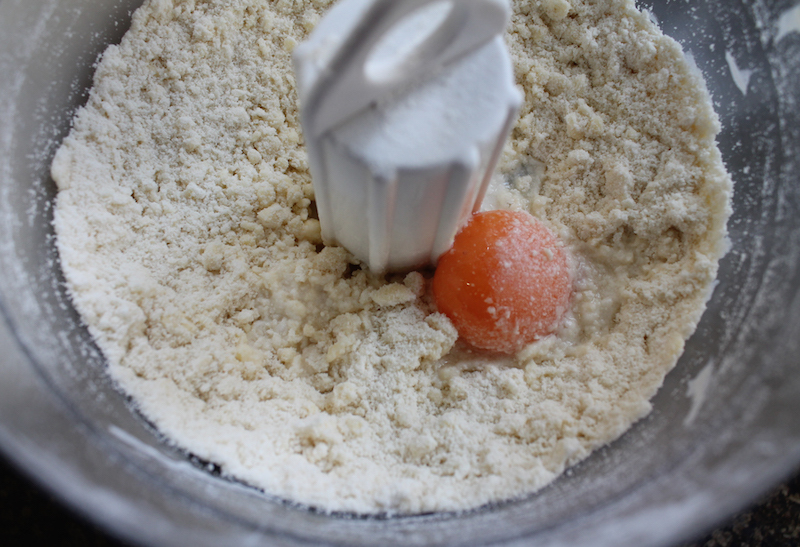 Pulse again, scraping down the sides of the food processor in between pulses, until the dough just comes together. Turn it out of the processor and wrap tightly with cling film. Pop the wrapped dough in the refrigerator to chill. Start your oven preheating to 350°F or 180°C and make the filling. 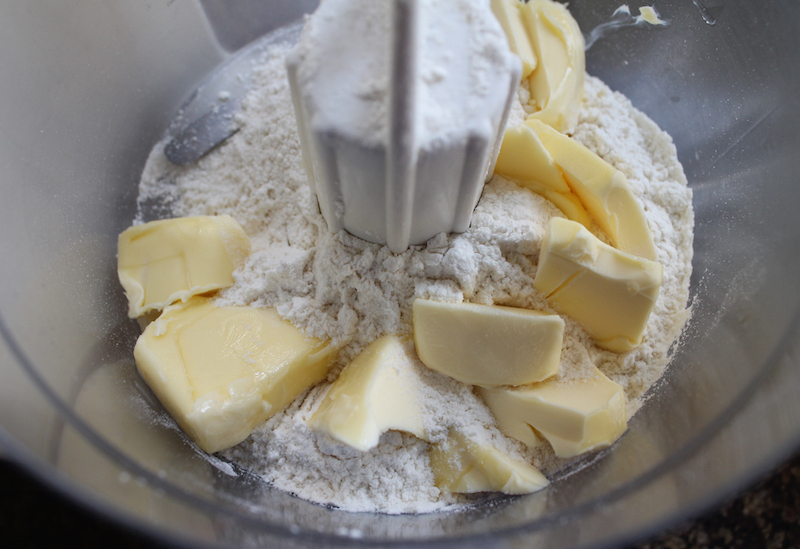 In the bowl of your processor or with electric beaters, cream the butter and sugar together until they turn pale yellow. Mix in the extract, salt and ground almonds. 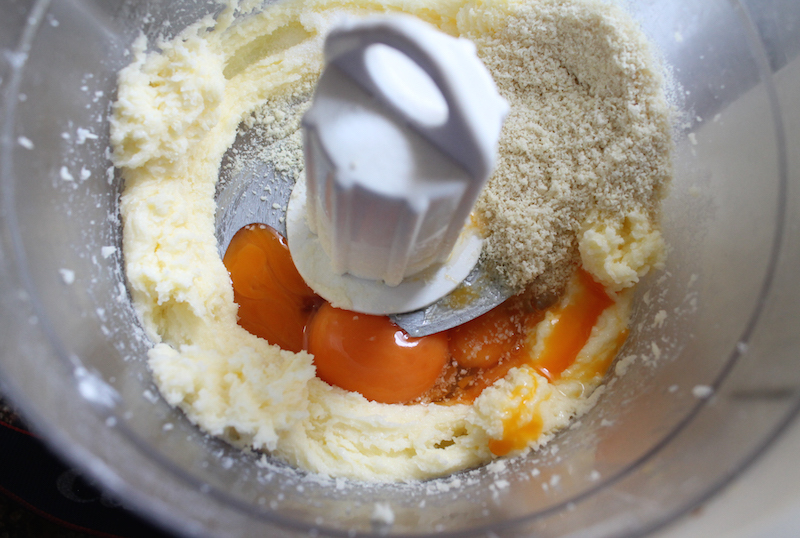 Add in the whole egg and one egg yolk and process until the mixture is well combined, scraping down the side of the processor occasionally. 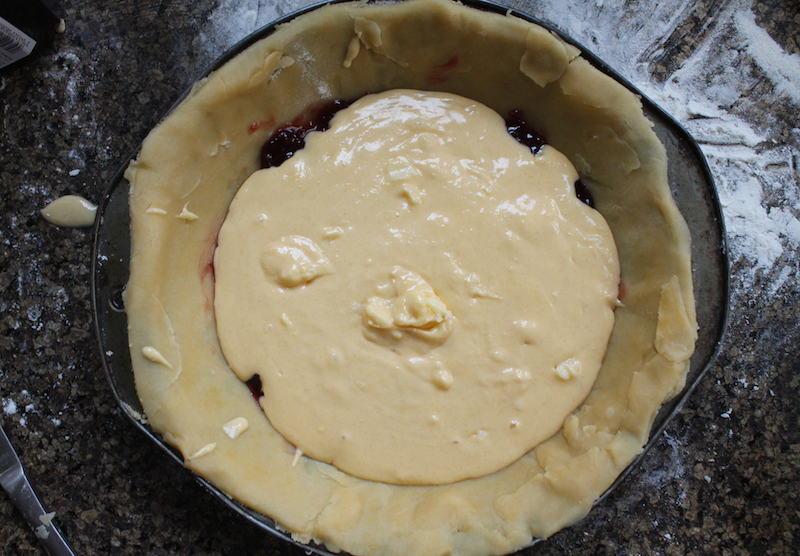 Roll out 2/3 of the dough and fit it into your pie plate. Spoon in the jam and spread it around evenly on the bottom. 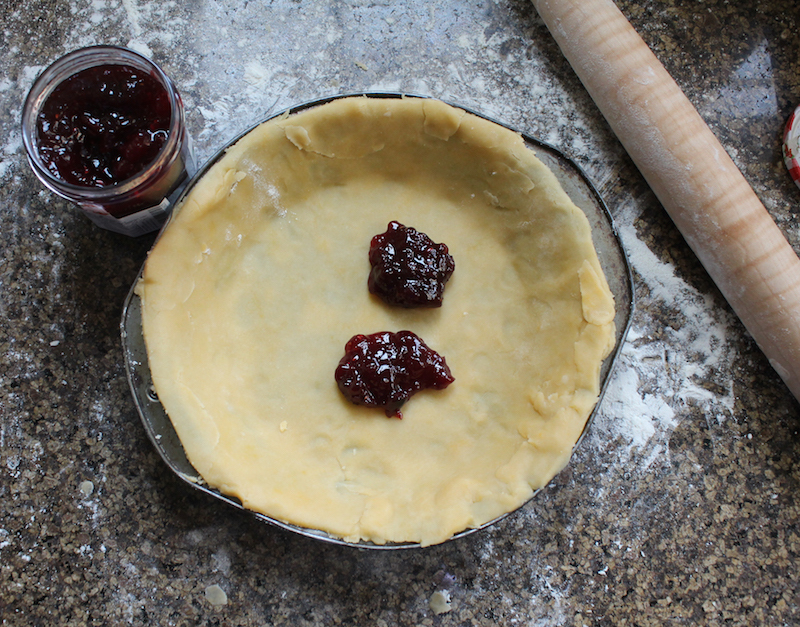 Pour the custard filling on top of the jam and smooth it out. 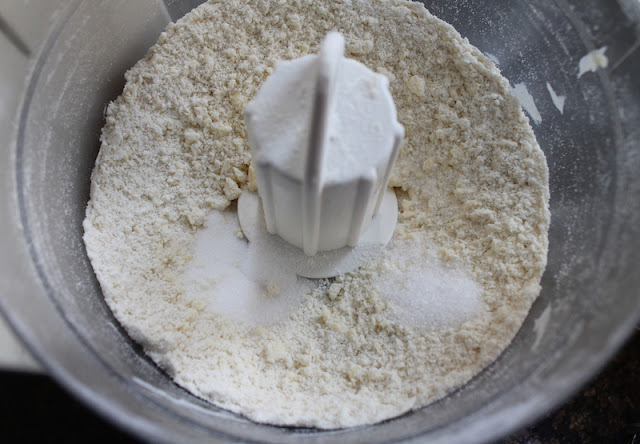 Roll the other piece of the dough out in a circle and top the filling with it. 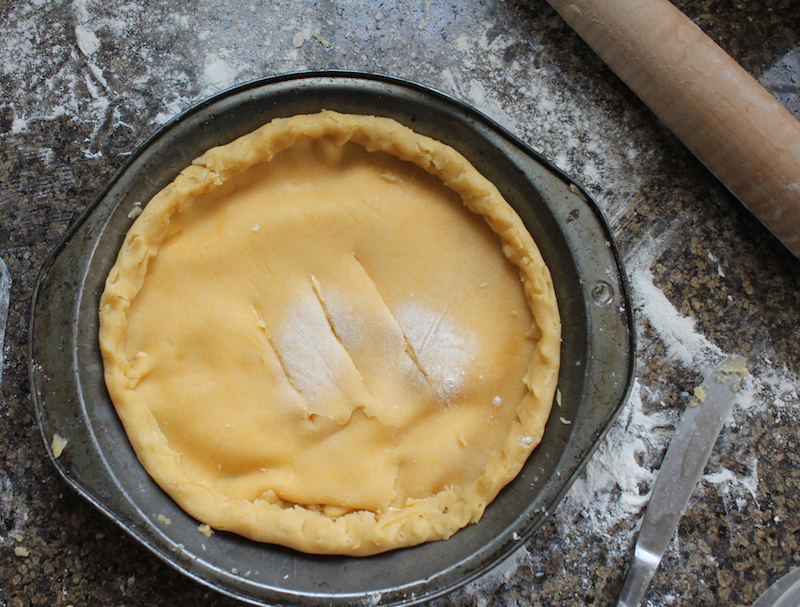 Push down around the edges to seal the two crusts together. 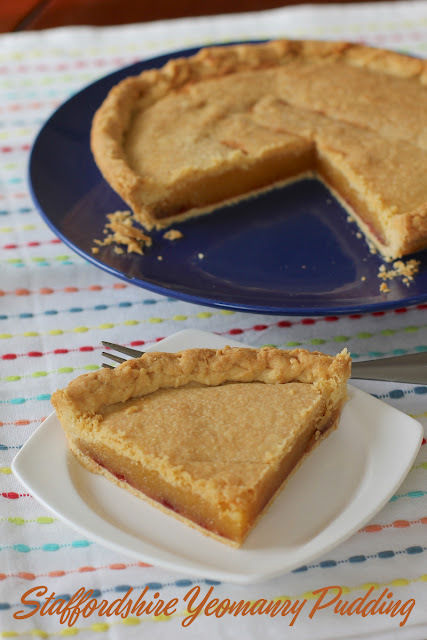 Trim the crusts to end about one inch or 2 centimeters above the filling. Fold the two crusts over together to seal the pie and form an edge and cut three slits in the top crust. 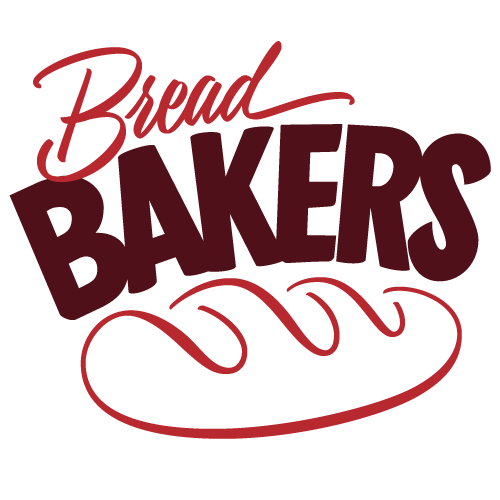 Bake in your preheated oven for about 40 minutes or until the crust is golden and the custard inside is set. Cool on a wire rack for at least 20-25 minutes before cutting and serving. My friend and creator of Friday Pie Day, Heather, over at All Roads Lead to the Kitchen has made another classic dessert with a funny name, but from the United States, shoofly pie! Head on over and pay her a visit.